Copyright © 2005, Tadashi Mori. All Rights Reserved. Harajuku Omotesando Genki Matsuri (Super Yosakoi 2005) was held on Aug. 27 and Aug. 28 in Harajuku, Tokyo. Junin Toiro won the Genki Award (Grand Prix). 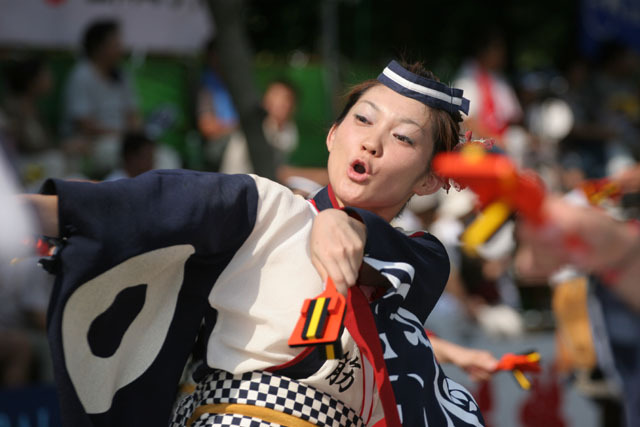 The 52nd Yosakoi Festival was held from Aug. 9 to Aug. 12 in Kochi while 177 teams, 19000 people participated. "Honiya" won the Grand Prix at the festival eve show and the Yosakoi Grand Prix at the main festival. "Kamimachi Yosakoi Naruko Ren" won the Takemasa Eisaku Award. Copyright © 1995,1996,1997,1998,1999,2000,2001,2002,2003,2004,2005, Tadashi Mori. All Rights Reserved.